Martha – WOW – What a Voice… Coming from a family of musicians and performers, Martha started singing before she started school. She’s had formal training in voice, music theory and several instruments. She’s sung jazz, 40s standards, classic rock, funk, and medieval and Renaissance music. She’s performed at the Kennedy Center and at the local music clubs in the DMV. Martha is now bringing her notable talents and experience to the stage with All Jammed Up. David has rocked the electric bass in the D.C. area since the early ‘90s, playing blues, rock, jazz, punk and funk with his unique style and flare. His studio credits include such bands as TheDeepEnd, Acme Blues Co., The Lantern Slides and others. Over the years he's played the best DC's venues, including The Bayou, 9:30, DC Space, Bohemian Cavern and Black Cat. He’s shared the stage with artists such as Bill Bruford and Dave Matthews. As the glue between rhythm and melody, nothing makes David happier than seeing the whole audience dancing and singing along with the band. Frank has been playing drums in a number of bands in Northern Virginia for the past 35 years. He played southern rock with the band Snake Goozley, opening for Molly Hatchet, The Outlaws and Blackfoot. He led the hard rock band, Dirty Jack, playing the DC Metro circuit for 10 years. Most recently, Frank has been setting the beat for the band – MOJO, playing weddings and private parties. Frank brings to All Jammed Up, that hard-driving beat and his high energy outlook on life. 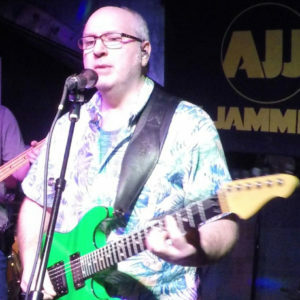 Jeff is the source of fiery leads, tasty licks and solid rhythms for AJU. He adds backup vocals and even sings lead vocals on a few songs. A native of Ohio, he has played guitar from Texas to Virginia, providing the driving foundation for rock and pop bands and even jazz combos. A metal-head at heart, Jeff’s stage and recording work have helped numerous bands get the crowd to their feet and reach the back of the room with exceptional musicianship. Mark joined his first band when living in Detroit. He spent years playing the club circuit in Minneapolis. For the past 15 years, he’s been playing in various groups in Virginia. 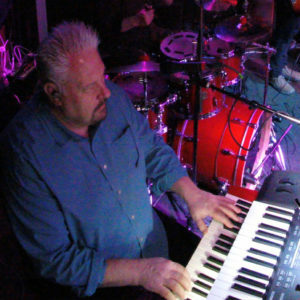 He plays the keyboards adding the Hammond organ, piano, clavinet and synths to fill out and sweeten the sounds of the band. On occasion, he adds backing vocals and has even been known to pick up an accordion. He’s fond of saying the guitar may be screaming, but a Hammond roars. Interested in booking the band? Like to suggest a song? Just want to chat? Send us this form – because we’d love to hear from you! @ 2019, Lake 12 Business Group, Inc.